It’s a problem that makes homeowners everywhere shudder. If you choose to ignore the warning signs, sewer line problems will make themselves known through extensive damage to your home. Luckily, the warning signs such as clogs, backups and other sewer problem can alert you to hidden damage before things get out of hand. What are the most common sewer line problems? There are many causes of sewer line problems – old pipes, FOG (Fat, Oil & Grease) build-up, off-set pipes, low-lying areas and tree roots. To prevent these problems, it is a good idea to have your lines regularly checked and cleaned out. How do I prevent tree roots from breaking up the pipes? How can I avoid the FOG clog? FOG is a build-up of sticky fats that slow the flow of water. Avoid pouring grease, sauces, milkshakes, and other fatty foods into the sink. Also, things like coffee grounds and other solids that can get stuck in the fats should always go in the trash, not the garbage-disposal. How can I detect these and other possible problems? There are some ways that you can catch sewer problems before they ravage your yard and your pocketbook. Pay attention to the water levels in your toilet. If they seem to fluctuate, you may have a problem. Also, if your shower builds up and your sinks are slow to drain. And of course, routine checks by a professional. We want to help you catch problems early and prevent more costly repairs! We can do an inspection by sending fiber-optic cameras down into the drain lines. Instead of a guess or estimate – we can actually see what is going on! 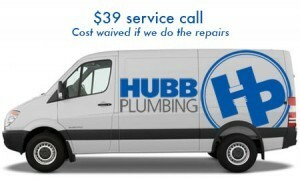 Call Hubb Plumbing for to get an accurate quote and fair pricing on sewer line maintenance. For Sewer Line Problems, We’re Available When You Need Us! Don’t let sewer line problems get you down. Contact Hubb Plumbing! Since 1987, Hubb Plumbing continues to be the first plumber to call in Snellville, Grayson, Loganville and Lawrenceville GA.